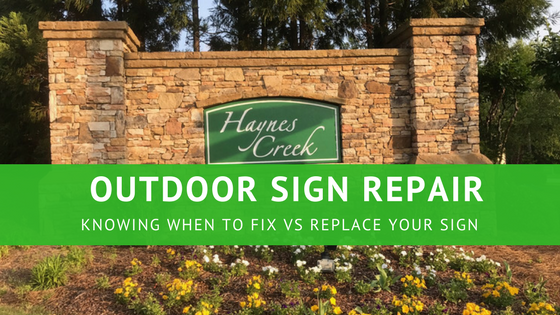 Outdoor Sign Repair or Replacement, Which do you need? 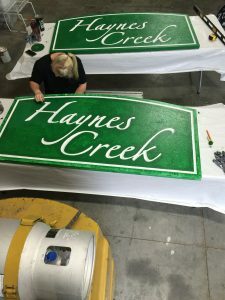 As a brick and mortar business, it is important to be aware of and know how to rely on your sign company to perform outdoor sign repair to maintain your company branding. Signage can be just as essential in a marketing strategy as any digital presence used to promote your company brand. Constant awareness of how your signage is performing can be just as essential as monitoring your Google Analytics account. Here are a few questions to help you starting thinking about the current state of your company’s signage. Can you still read the sign? After long periods of exposure to natural elements, signs can fade from natural wear and tear. That doesn’t mean that the entire sign needs to be replaced. Signs can often be repainted or vinyl can be re-applied to renew the life of your sign messaging. Is the sign leaning or damaged? Mother Nature can often leave your sign in worse shape than how she found it. Wind, rain, and storm debris can damage both the sign messaging and the structure of signage. Long periods of rain and a wet ground can make a sign base lean from the dirt settling. Coro signs can be blown all over the area during heavy wind gusts, and tree limbs are notorious for placing unsightly holes or cracks in signage. However, each of these problems can generally be fixed through simple sign repair tactics. Do you notice any rot, rust or erosion at the base of the sign? If a sign is not properly maintained during its lifetime, it can begin to experience corrosion. Depending on the type of hardware used for installation – the wood, rock, or metal base can waste away from the same day to day elements. 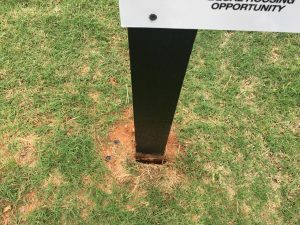 Outdoor Sign Repair often involves re-staining wooden posts, refinishing metal surfaces, or creating a proper irrigation strategy for rock or other types of monument signage. Does the sign still function as it did when it was installed? If your sign has illumination then have you checked to make sure all your bulbs or electrical components are still working. From something as simple as a bulb replacement or cutting down overgrown tree limbs and grass – there are some simple steps to making sure you sign continues to function as well as it did on the day it was installed. By doing proper maintenance it can extend the life of outdoor signage. Is all the information still correct? Something as simple as a phone number, website or change to your hours of operation can make your signage provide incorrect information. Often you can recover or redo part of a sign without having to create new signage. 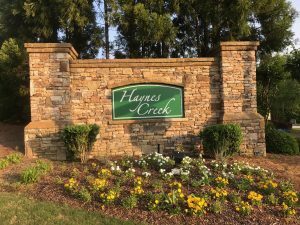 This is case by case with each situation but it is worth speaking to your sign company about ways to refresh the sign itself. Consulting a professional sign company is usually the first step in repairing any damage to outdoor signage. Most sign companies can provide you options that range from simply re-facing signage to replacing parts. Redesign or fabrication of signage can be covered during a consultation with the sign company as well. Professional sign companies can often provide you tips to prevent further damage and maintain the current signage to reach maximum life expectancy. The other option is to replace or remove your signage. Sometimes it become apparent that the old and worn out sign simply isn’t doing much to market your business or provide wayfinding for those passing by your location. When this is the case, it may be best just to have the sign removed. It is also possible that it may cost you less money to replace a sign than try to repair it. Depending on parts and time frame to refinish your signage, a whole new sign may be the most cost efficient option.